Today we have a chance to dig down on the ASUS ROG Strix X299-XE Gaming. The XE Gaming differs from the non-XE by adding a larger VRM heatsink and includes a 40mm fan and mounting hardware to further assist VRM cooling. A number of companies are releasing 'XE' models with larger heatsinks, although the fan will be an interesting addition. ASUS started the Strix line of hardware a few generations back and has now expanded to a lot of their product lines including headsets, mice, keyboards, mousepads, sound cards, graphics cards, and motherboards. Initially, it was a 'zero decibel silent' brand, focusing on GPUs, but is now more along the lines of a budget gaming brand and spread to multiple categories. According to ASUS, the word Strix is taken from the ancient Roman and Greek Word for an owl, meaning the keenest hearing and sharpest eyesight - traits that a number of gamers want and/or need. To that end, the Strix lineup fits under the Republic of Gamers (ROG) branding. The ROG Strix X299-XE Gaming offers 3-Way SLI and Crossfire support, an Intel NIC, an ASUS tweaked Realtek ALC S1220A audio, and focus on the larger heatsinks to help with power delivery cooling. The ROG Strix X299-XE Gaming came out due to the hullabaloo over the general pervasiveness of X299 weak power delivery, and more specifically, weak heatsinks cooling the VRMs. While most would do an acceptable job at stock and mild overclocks, when things really would get pushed some boards had issues in specific testing situations relating to thermal runaway. 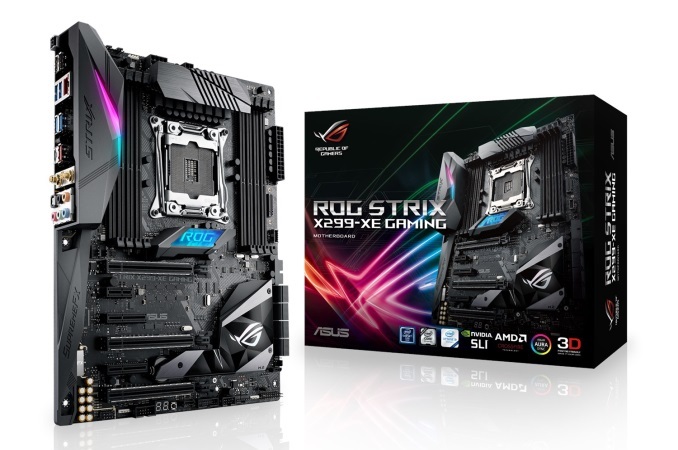 Both ASUS and ASRock have updated a couple boards to XE models, and ASUS gave the ROG Strix the same heatsink bump to support the flagship 165W parts as well as peace of mind when overclocking. Overall, default performance on the ROG Strix X299-XE Gaming was average to a bit below average due to the lack of Multi-Core Enhancement - in order to assuage some issues at X299 launch, ASUS has moved MCE to disabled by default, but it offers the feature when XMP is enabled. So in the case of the Strix we have, the CPU boosted all cores to 3.6 GHz throughout testing. The results may be related to how the board ramps up and down the frequency in my testing environment at the time. Boot times were square in the middle of the pack while power use was on the lower side compared to previous boards we've tested. While in most other tests it was a middling or bottom half compared to the other boards. Overclocking results were the same as the other boards topping out at 4.5 GHz and hitting our temperature limit. The ROG Strix board allows users to have almost the full run of storage connectivity. There are eight SATA ports (the maximum from the chipset), and two M.2 slots - one horizontal under the chipset heatsink, and one vertical by the DRAM slots with its own support bracket. The first M.2 slot, under the chipset, supports both PCIe and SATA drives, although it will share with some of the SATA ports when in SATA mode. The vertical M.2 slot only supports PCIe based modules. There are a total of six PCIe slots with positions 1, 4, and 6 (top to bottom) all CPU connected and intended for video cards. PCIe slots 2 (x1), 3 (x4), and 5 (x4) are all connected via chipset. For connectivity, there are USB 3.1 (10 Gbps) Type-C and Type-A port on the back panel fed from an ASMedia 3142 controller. 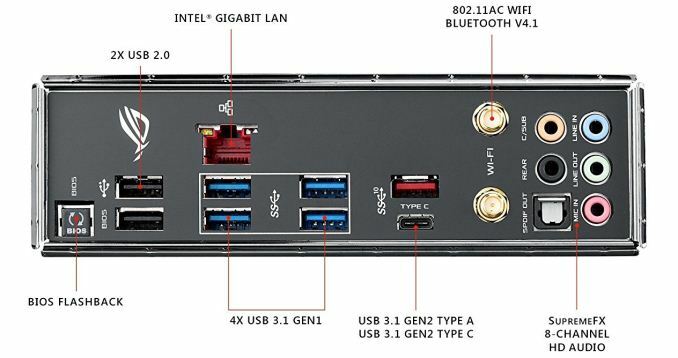 There are four other 5 Gbps ports on the back as well as two USB 2.0 ports. Also on the back panel is a five-plug audio stack plus SPDIF, 802.11ac Wi-Fi antenna mount points, the Intel NIC, and a BIOS flashback button. Not a large number of USB ports, but it should be enough for most users. The ROG Strix X299-XE Gaming is currently priced at $369.99 at both Newegg and Amazon. The pricepoint slots the board in the middle of ASUS' product stack with the Apex, Prime Deluxe and RVIE above it. The non-XE version of this board comes in at $320 which and is nearly a $50 price increase. Compare that to ASRock's Taichi and Taichi XE are $20 apart (the latter does not come with a fan, note), that is a significant price jump for a larger VRM heatsink and a fan, so users should be sure that their use case would benefit before spending the cash. 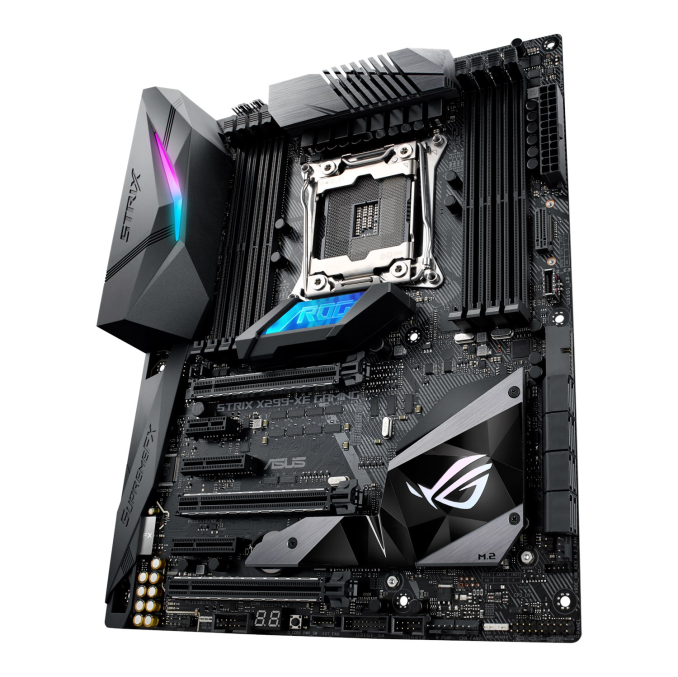 ASUS brings a current total of eight X299 boards to choose from: the ASUS ROG Rampage VI Extreme making its home in the Republic of Gamers (ROG) enthusiast segment along with the ROG Rampage VI Apex and the ROG Strix X299-E Gaming and Strix X299-XE Gaming (review soon!). The Prime segment consists of two boards in the Prime X299-A and the Prime X299-Deluxe. The TUF lineup also consists of two boards, the TUF X299 Mark 2, and TUF X299 Mark 1. "ten of thousands of dollars"? Sounds a bit excessive given that 1 (or 2, where possible) of the most expensive components available still doesn't really get you to $10K. Unless you're buying by sorting for the most expensive anything and taking as many as you can fit in a case.
" The smaller slots are an x1 and two x4 slots (the first runs at 1x) powered by the chipset for add-in cards. " With the exception of the P3 all of those predated the Xeon branding. Dual socket P3 was presumably transitional in their rebranding. For modern chips, on the Intel side mainstream parts have neither the on die hardware, nor chip socket support for multi-socket setups because doing so would inflate the costs of the 99.9% of systems that are single socket. I'm less sure of the situation with AMD. I suspect that due to the level of die sharing they're doing between TR and Epyc that TR cpu dies themselves have the hardware needed to talk to a second CPU socket. However I'm skeptical that they've also paid extra for a larger/more complex socket on mainstream TR parts. It'd raise costs for the 99.9% of uni-socket systems and cut into sales of their more profitable Epyc line.